Ever-curious and led by their noses, Molton Brown travel the world to discover the rarest, most precious ingredients and bring them back to England to create colourful, complex aromas. Each and every one is composed just like a fine fragrance, blended in collaboration with some of the world’s leading perfumers. Whether it’s meticulously selecting the perfect gourmand notes or giving classical scents an unexpected twist, they experiment until it’s just right. A collection of sophisticated, intricately-balanced compositions for her and for him. 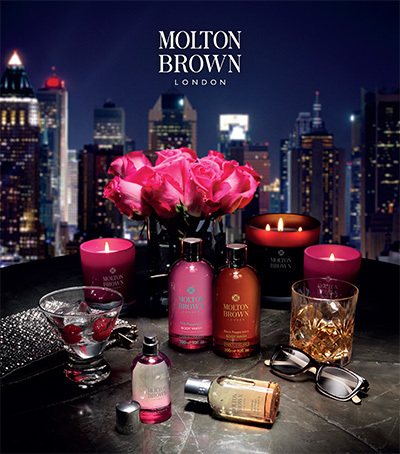 With over 25 years of experience partnering with the world’s most esteemed hotels, Molton Brown know the ingredients to enhancing your guests’ sensorial experiences. As a worldwide leading luxury bath and body brand with an irrepressible love of travel, they enjoy a renowned global presence and customer base. They meticulously craft their blends in-house, with their hotel amenities sharing the same flawless formulas as their retail collections. Copyright © Treasury on Collins. All Rights Reserved.